Success finally! Both TPMS batteries ran out of juice in my 2012 TEX. Dealer is an hour away and wanted $260 for the pair plus a half hour shop labor to “learn” new units. Plus they were booked two weeks out. That is over $500 including programming and their significant “tires on the bike” re-mount and balance labor charge. 1. PURCHASE Renata coin cell with solder tab. I could not find Renata’s OEM battery design so I used Cat no: CR2032 MFR FV. (In the USA batteries can be found at Mouser Electronics $1.75 each. Or Batteriesinaflash.com for $8(!) ). Order 2 extra in case you solder badly or receive dead ones. Plan ahead because lithium batteries cannot legally ship by air...ground only. 2.TEST each new battery with multitestor to confirm 3volts. I failed to do this and wasted $45 for a second remount and balance because my new soldered and installed battery was dead from the supplier. 3. RECORD serial number and clearly note whether it is front or rear TPMS. If you mix them up and one dies you will try to fix the wrong one. Also note that installed valve stem points to the right side of TEX. Remove TPMS unit from wheel. Retain the tension spring and valve in a safe place. 4. REMOVE SERIAL NUMBER LABEL because a tiny T-5 screw is hiding under it. Unscrew that and gently lift plastic cover. Note there is a small tab on the end that releases. 5. UNSOLDER tab connection and resolder new battery in place. Note that +positive faces up. 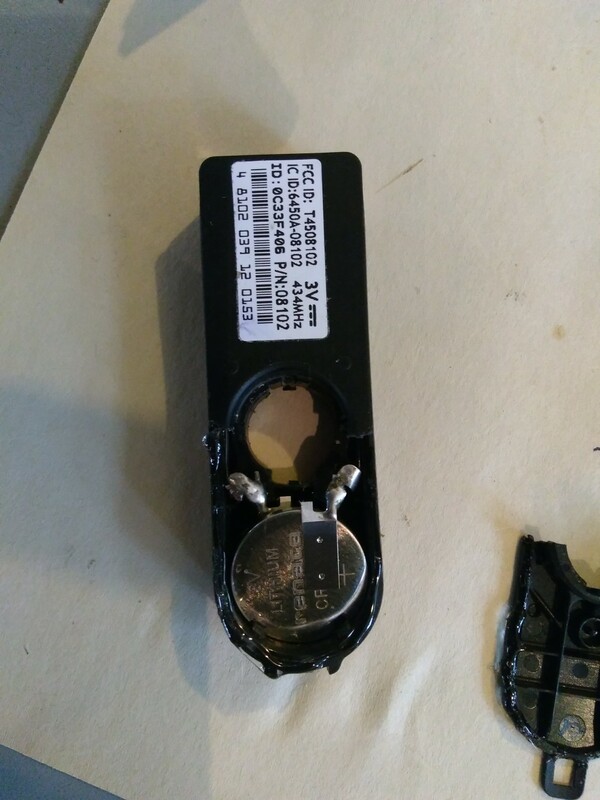 I stuck new battery tab through the hole in the TPMS tab and soldered that so there is a mechanical connection in addition to the solder. 6. Replace black plastic cover and reinstall. I did not have these hints and had to epoxy my cover back on because I broke it in half. Use c-clamps or spring clamps if you break the cover. 7. Remount and balance tires. New tires of course. 7. TEST ride. No more dashes or red warning light! TEX did not need to relearn or reprogram. My total was $56 because I bought numerous battery designs hoping one would work. I also did not know about Mouser. You should be out less than $20 including shipping. 8. BUY lunch with the $480 you just saved. I am also the owner of a 2013 Triumph Trophy with TPMS and on the Trophy forum one member posted how he replaced the batteries in that unit. I have not taken either apart, but they may be similar. The sealed versions use a higher capacity battery so are designed to last longer, but the batteries can still be changed. It's a tad more fiddly because you have to peel away the potting compound around the battery then re-pot the area once the battery has been replaced, but it can be done. I've changed mine twice in 6 years - it does annoy me a little that the one in my Mazda 6 never need looking at !!! And are half the price of the Triumph ones !! I do not want to misunderstand this. I've never had TPMS on a motorcycle. Thinking of paying $500 to replace them when the batteries discharge seems rather, well, stupid. Manufacturers expecting us to pay this for the privilege of TPMS seems out of touch. The first car I owned with TPMS lasted almost ten years. I sold it without ever thinking about changing batteries. I'm on my second car with TPMS and am now four years in without issue. Threads like this that help us bypass the excessive common services is golden. Fred - you are so right !! Thats exactly my opinion - stupid price and unreliable compared to my Japanese car .